Welcome to the Official Promise Foundation Website! The Promise Charitable Foundation was established with one basic mission, the promise to help educate and motivate kids!! We are currently engaged in a campaign to educate kids about extreme street safety, to be more responsible for their own safety, knowing the real rules of the road, and always wearing a helmet, safety comes first naturally! 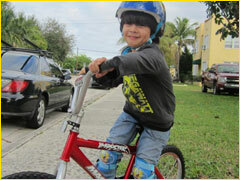 Currently we partner with Broward County to collect refurbish and distribute used bikes as a motivational tool to win The Promise Bicycle Giveaway Essay Contest. This program is supported by bikers, skaters, local shops, venues, big name sponsors, county government and you! Thanks to everyone who makes a difference! Be the change you want to see!